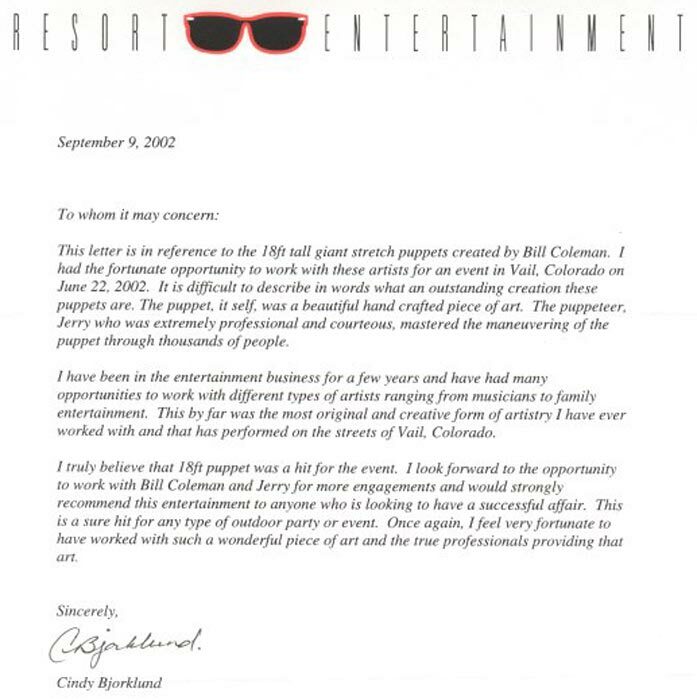 "It is difficult to describe in words what an outstanding creation these puppets are. . . ."extremely professional and courteous . . . ."
For entire letter from Resort Entertainment, Vail click here. "We had our wrap-up meeting on October 3 and the consensus of the 13 member Steering Committee and OCA staff was that your presence just made everything more Fun!" 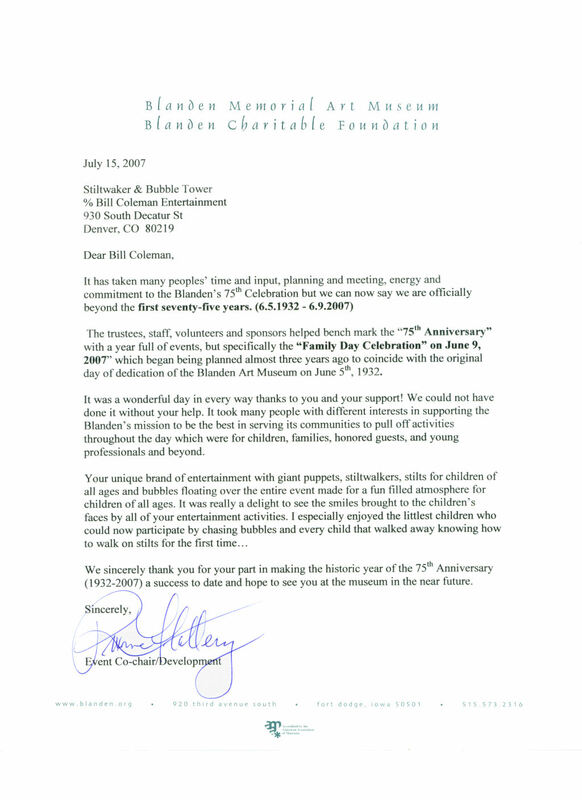 "Your unique brand of entertainment with giant puppets, stiltwalkers, stilts for children of all ages and bubbles floating over the entire event made for a fun filled atmosphere for children of all ages." 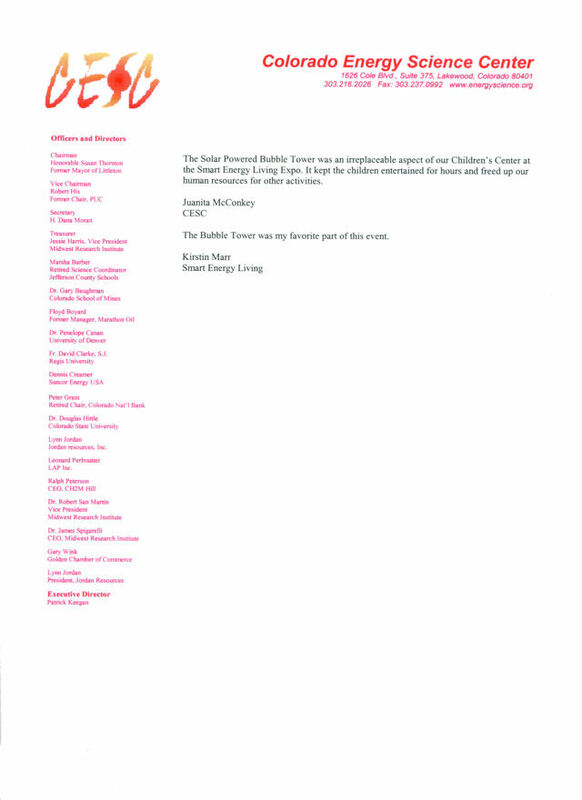 Wanted to let you know what a wonderful job you did for us at our LOL event!!!!!!!!! KRISTI TORREGROSSA | Logistics Coordinator Forte Events, Inc. Thank you so much for being here. You were a tremendous addition. I hope it works out for you to be here next year as well. Check out the You Tube footage at the link below. The two acts (Dancing Christmas Tree and Giant Candy Cane) were absolutely wonderful at our BIG arrival. We got great feedback and they looked awesome. I know this is short notice, but are they available this Sunday, November 18th from 1pm-4pm? The Solar Powered Bubble Tower was an irreplaceable aspect of our Children’s Center at the Smart Energy Living Expo. 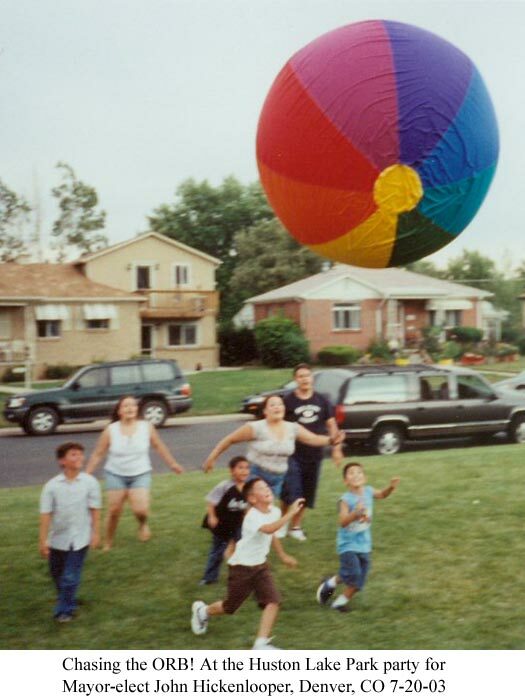 It kept the children entertained for hours and freed up our human resources for other activities. 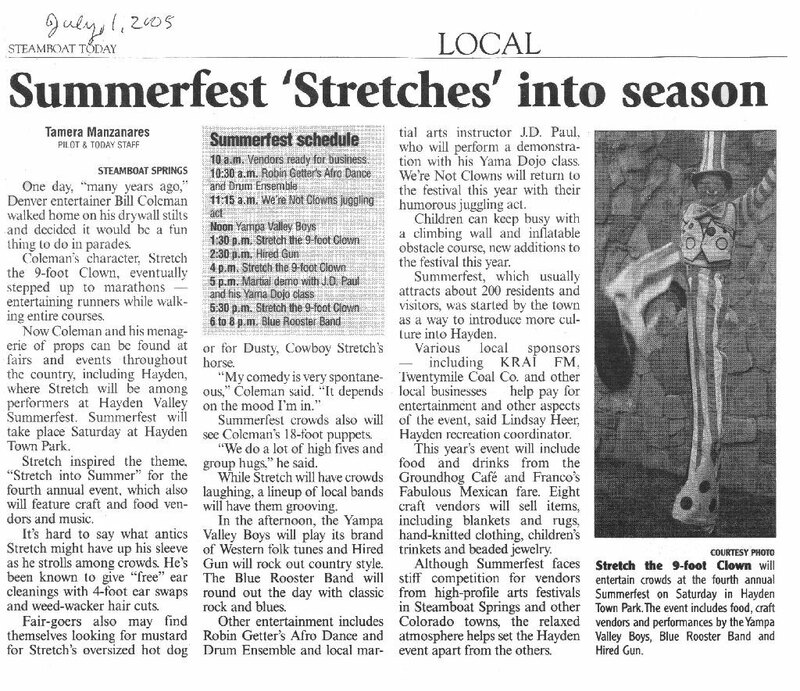 Check out these great newspaper articles for the Hayden Summerfest. 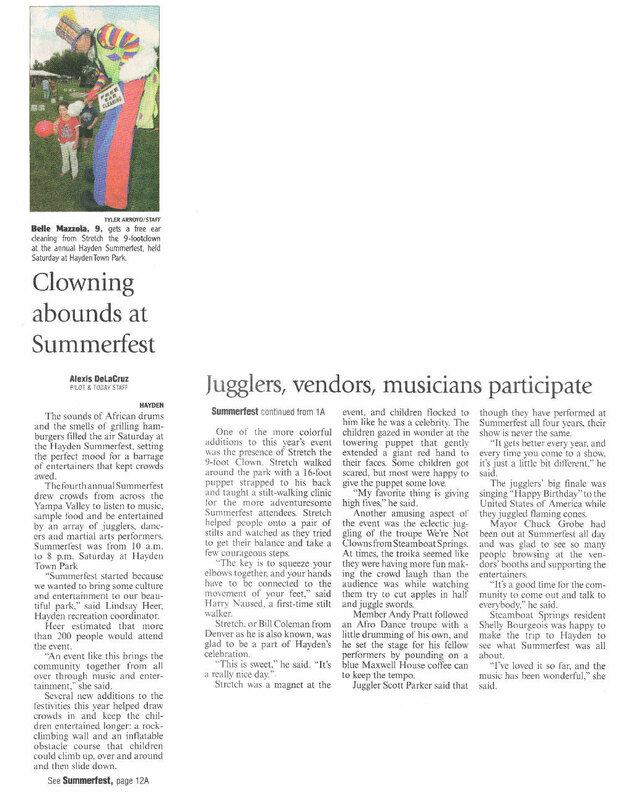 "Specialty groups receiving raving comments from spectators were the two tall puppets, stilt walker in the candy cane suit and the walking Christmas tree. Emails were received from individuals within the community commenting on how much both the adults and children enjoyed them. Definitely an added treat!" 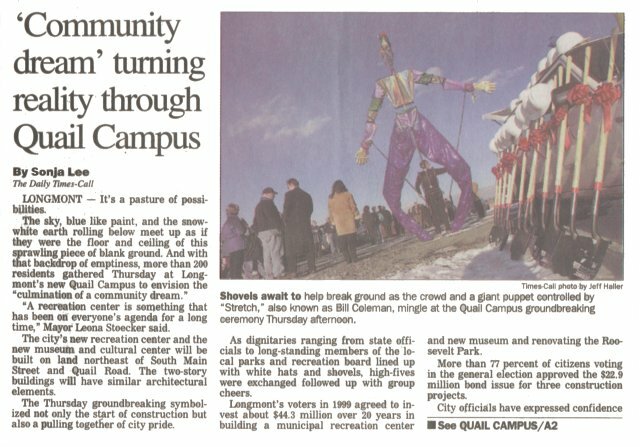 From the January/February 2004 City Style newsletter of the Downtown Tulsa Unlimited on the 2003 AEP-PSO ChristmasParade of Lights. function." 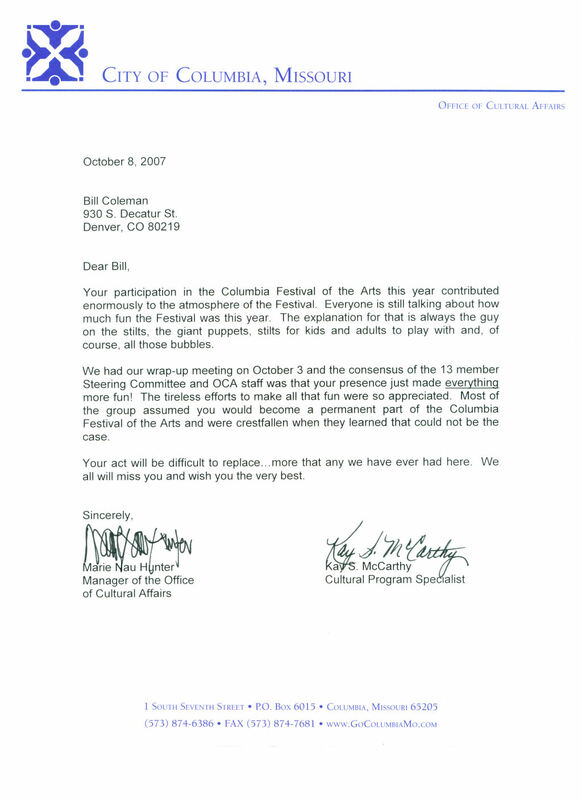 More from the Golden Chamber of Commerce, click here. "Everyone had a lot of fun with the stilt walking and the puppets!! You guys were great!" Aztec, New Mexico Chamber of Commerce. 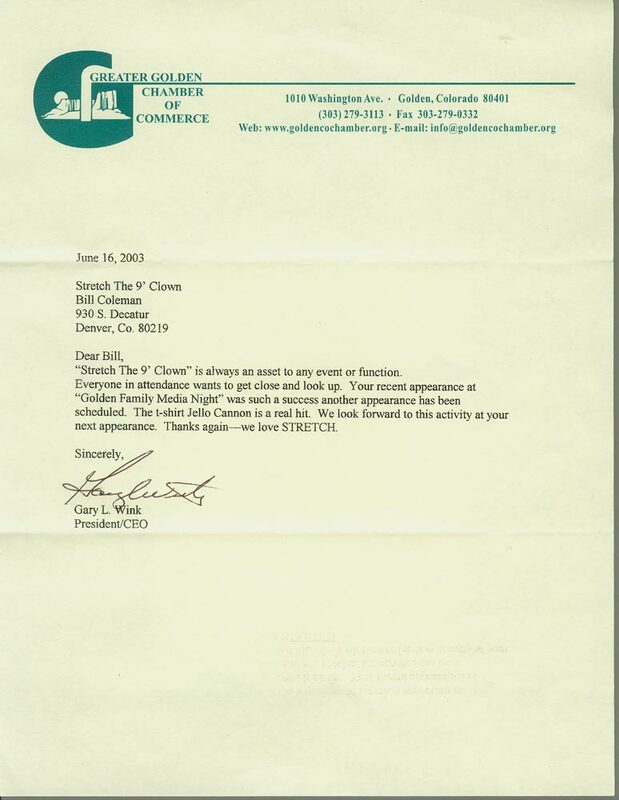 Click here for the entire letter. Stretch (the Giant Candy Cane). For them you came ahead of Rudolf and Santa". Thank You so much for coming to our Business After Hours! 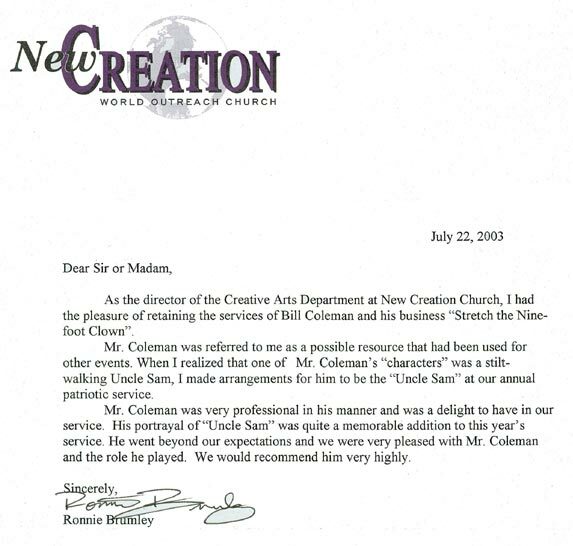 "Mr. Coleman, Thank you for stretching our variety of entertainment at the street faire this year! We enjoyed your creativity and excitement throughout the summer! Believe me I will not hesitate to use you in the future . . . Just everything you did was just great. I appreciate your professionalism. 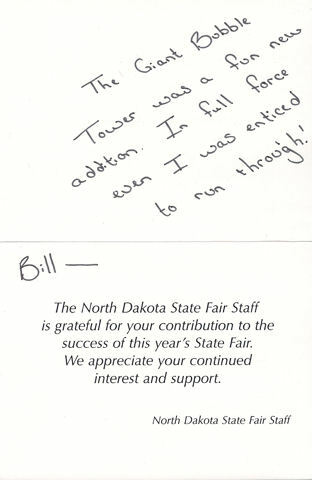 I appreciate your spontaneity, and everything you did. .
. . And your costume was absolutely great." ". . . legs longer than Shaq . . ."
"You were great! The kids really enjoy you interacting with them! 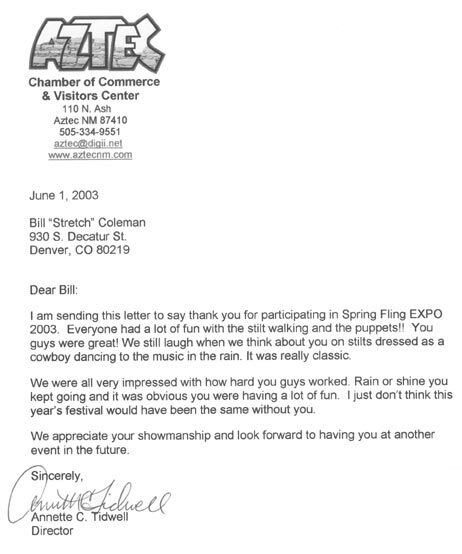 "You were a wonderful addition to the event and everyone enjoyed your unique talents. festive, magical atmosphere for our walkers. everyone had so much fun." 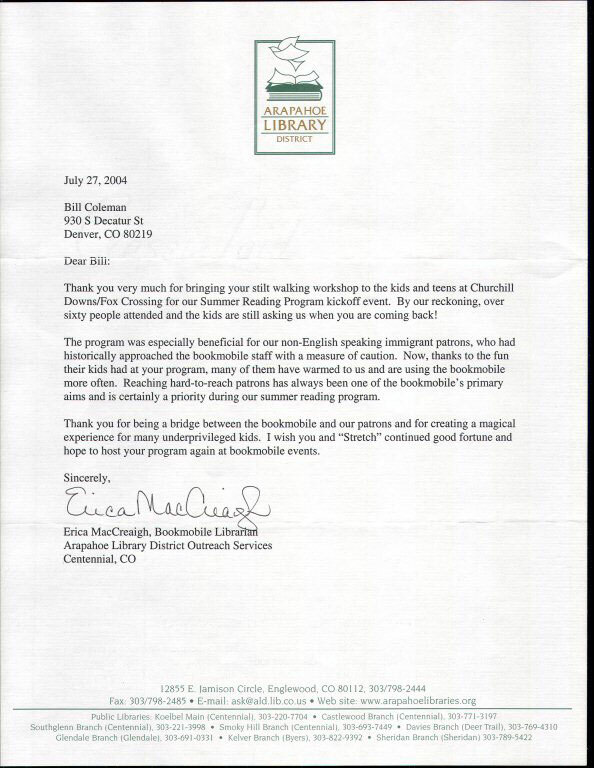 "Your enthusiasm and energy helped create the ambiance we were searching for . . . .
We look forward to working with you again in the near future." "You were quite a hit! Thanks for coming to KidSpree." "You guys made me a hero" "It was AWSOME!" 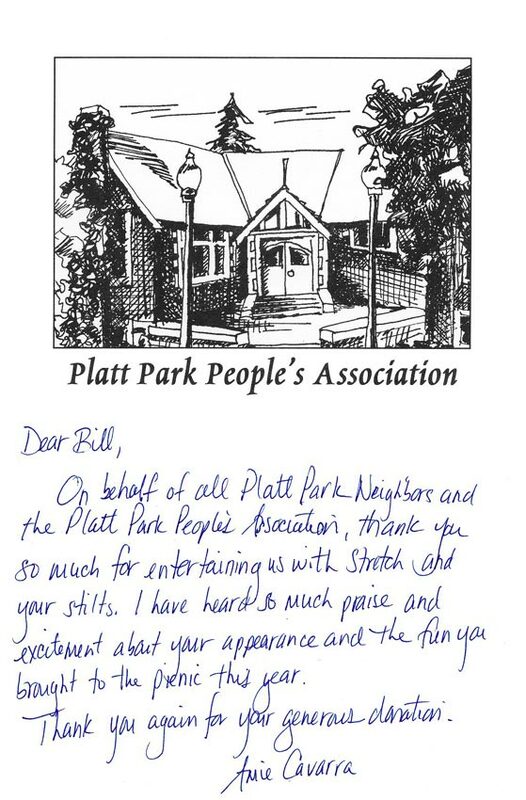 neat touch" Chuck Schilling, private party , regarding the "9 foot tall valet parking attendent". Thanks for making this happen. The guys were great and so was your puppet. 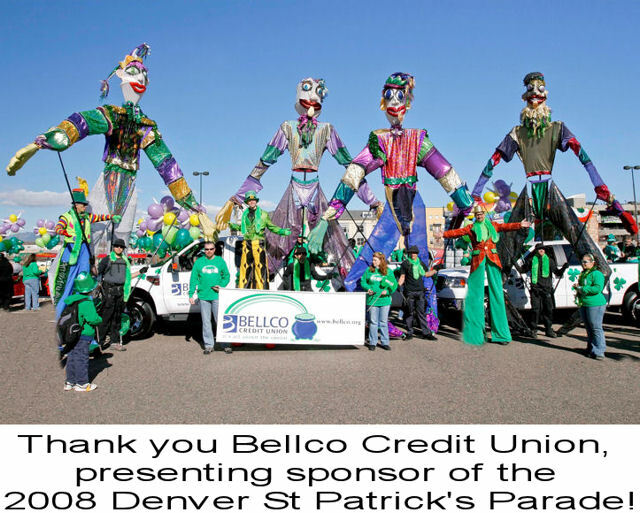 Thank you so much for helping make the Bellco St. Patrick's Day a HUGE success! Everyone on the marketing team heard nothing but great comments about the 18ft puppets and how they really interacted with the crowd. Laura Higgins was so happy that we had 4 puppets/walkers not 2, she really thought that it made a big impact. The pictures you sent over are wonderful and I am using them in the parade recap package to Bellco. 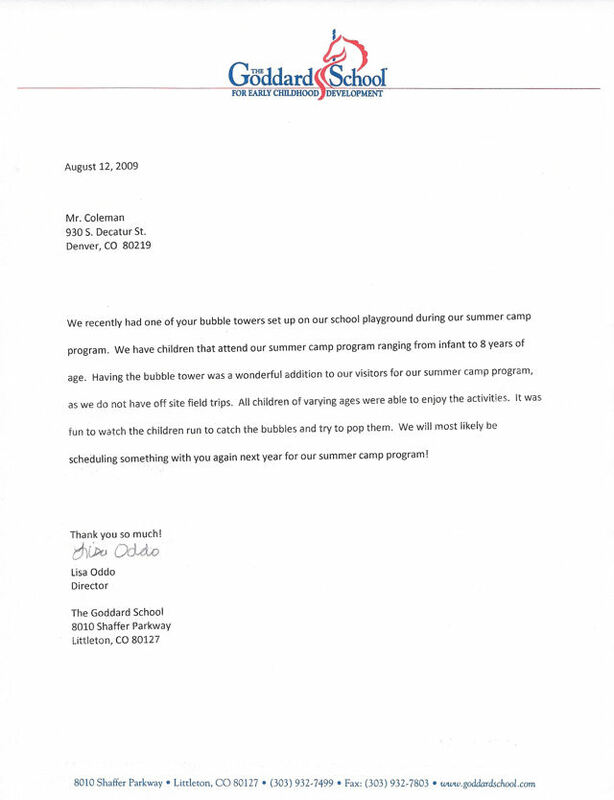 I believe that Bellco will be calling you again this summer to work at couple some festivals and events...we are determined to use the bubble tower! Thanks again for the wonderful showing! It was more than we had expected. What a crowd-pleaser! That would be great to have some pictures. Thanks so much; you were a rock star hit as usual! Wild Iris Recreation Services, Inc. I just wanted to thank you again for participating in the Street Fair on Friday. 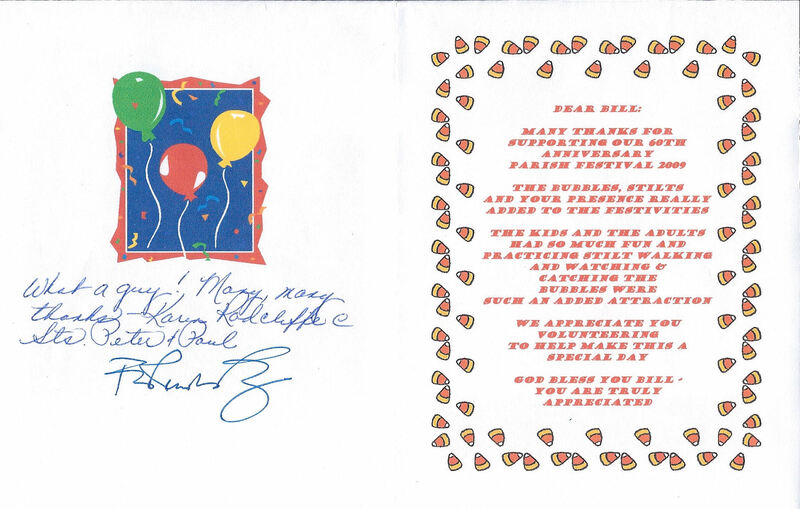 All the kids (and adults) loved you and really enjoyed your entertainment. 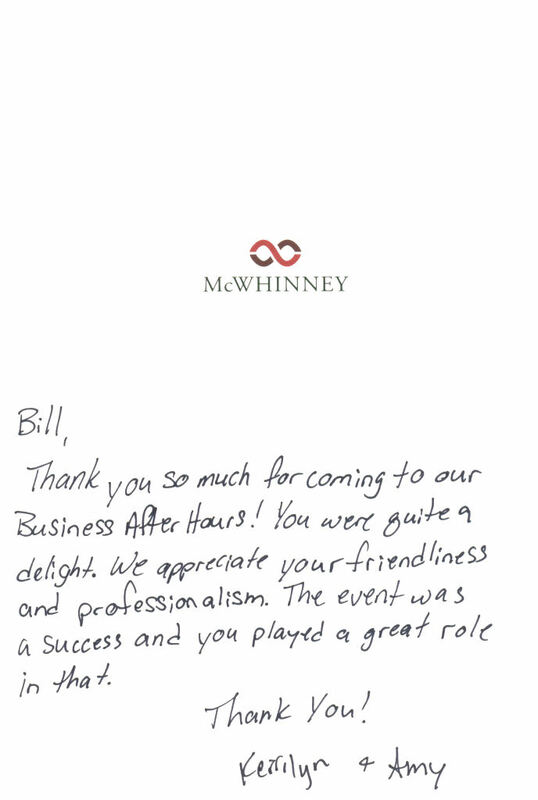 I hope you had as much fun as we did and we hope to work with you again soon! I just emailed you! The client was very pleased, thanks! I loved the trees and did get a few photos, but they weren’t great. I can send what I have if you like. I really liked working with Jerry. He’s a good guy. And I liked the wranglers you hired as well. I look forward to working with you again soon, and thanks for sending me some good performers!!! "how'd you get so tall?" Will you pose for a photo?" "you walked the WHOLE five miles!????" "NO, you can't park my car!" What about pricing? What are your fees? You can choose from several options: One or more entertainers, comedy action stilt performing, Giant Parade Puppets, several Group Activity options and attractions. Our goal is to make this easy and enjoyable for you! About all we need is sufficient head room for the stilt performer and the giant puppets and a parking space for our truck. Allow at least 9 foot of clearance for most of the stilt costumes. The dancing Christmas Tree is a little taller, but both the Tree and most stilt costume characters can bend to walk through a normal doorway. 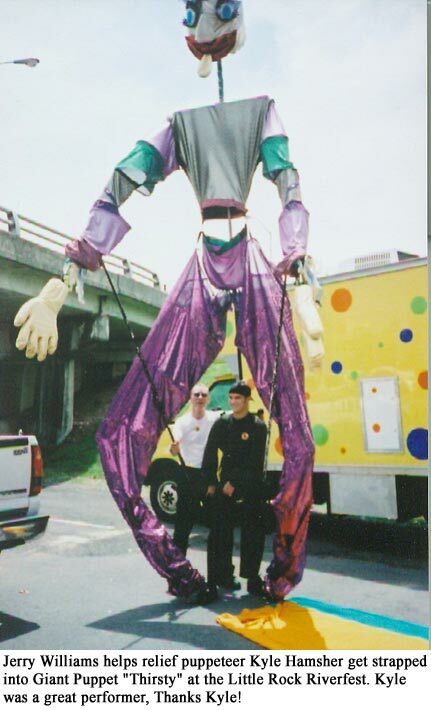 The giant Parade Puppets are in the 16 to 18 foot tall range, and can easily duck under traffic signs and power lines. They will not fit through a 12 foot tall tunnel. The puppets easily fold up to be carried through a doorway like you would carry a tall ladder. 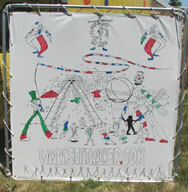 The T-Shirt Jello Cannon is great for launching sponsor’s Tshirts, golf towels, fleece, confetti or even Jello!!! With adjustable power, the cannon propels the t-shirts so they open in flight to float down to the crowd. With care, the TSJC is suitable for stadium or open field. Not for low ceilings! Will launch t-shirts 40 to 100 or more feet depending on weight and size of t-shirts, wind and your needs. Confetti or other lightweight items won’t fly as far as t-shirts. Can also be used to launch water soaked chunks of foam or foam toys for cooling summer time fun! Watch the video or ask for a demo. This is a great opportunity for your sponsors to become involved in your event to deliver their message in a highly charged, emotional and memorable fashion! Stilt Walking Party or Workshops with old fashioned hand held wood stilts. Size of venue can vary depending on the number of participants and space available. Best away from traffic, store windows, and autos. A tennis court, a blocked off street intersection, a small or large gym, even a wide sidewalk can all be used successfully. May require supervision, see Q and A below. Black top, concrete, and grass all work well. Smooth is better than bumpy. Until people learn to lift their knees, they fall a little more often on bumpy unimproved fields than they do on grass. year old set. Great Fun! The Giant ORB is a wonderful toy for group activity if the venue is appropriate and it is not too windy. A wide open field with a volley ball net is best. 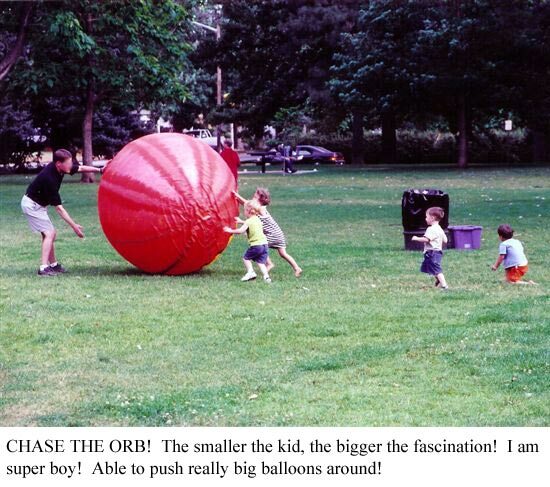 The ORB is a six foot tall cloth covered balloon that is very light weight and loads of FUN! Ideally this performance requires a circle of about 60 feet depending on wind direction and speed. Area should be as clear as possible of lamp and sign posts and over head obstructions. 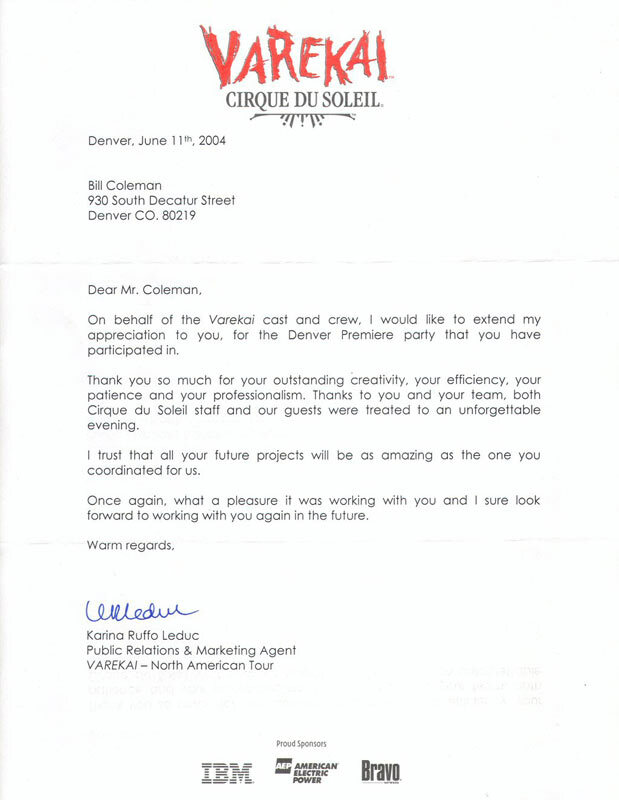 Usually performed out doors, I have done this performance in one of the ballrooms at the Denver Convention Center for the Beaux Arts Ball – a much smaller area, loaded with tables and overhead hanging decorations! Great atmosphere when performed to music, with or with out stilt dancing. Overhead clearance of at least 25 feet is best. Also a great “keep a way” activity with the kids. See the New Solar Powered Bubble Tower! The Bubble Tower Sculpture is about 14 feet tall, and takes up about 18 feet of ground for the actual instillation. But of course more room is required, particularly downwind from the tower. Either pavement or grass is fine for the Bubble Tower. The area should be level, and not upwind of cars, vender booths, street traffic, or other hazard. You do not want the kids chasing bubbles blowing into traffic, or off a cliff, or into vender’s booths, or into the classic car show! 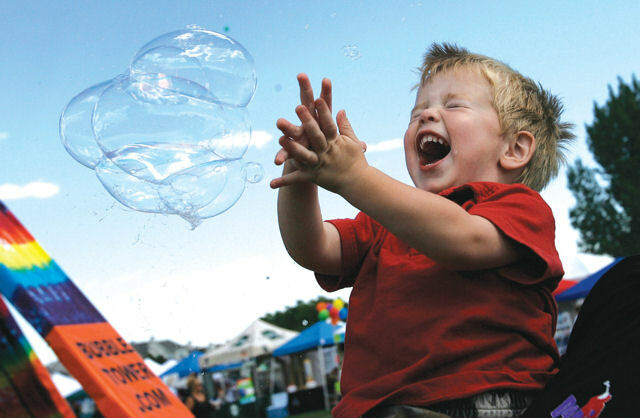 Strong wind requires a larger area, 40 to 100 feet or more and you may need to provide barriers or supervision so the kids don’t chase the bubbles into the street or other hazard. Light or no wind means the Bubble Tower can be shoe horned in between buildings! Not tested yet in cold weather, but should be good down to 25F or 30F degrees depending on wind. We do adjust the Bubble Juice formula to accommodate wind and low humidity conditions. Conditions that are normally not ideal for making bubbles. 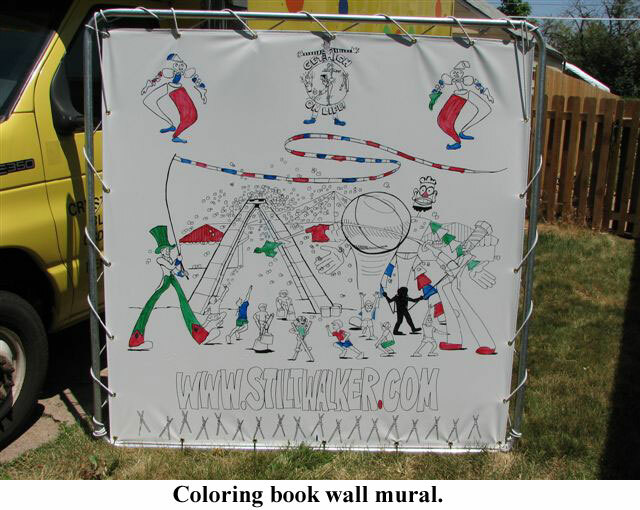 The Coloring Book Wall Mural consists of panels six foot high, and six foot wide. Using washable water based Elmer’s Squeeze and Brush, kids and adults can fill in (paint) the blanks. You will need to furnish an attendant to dispense and collect the paints and keep order. You may want to furnish a table, chair or shade tent. Truck height clearance is a little over 11 feet. Length is about 22 feet, so it overhangs a normal parking space, but not by much. Additional space for assembly of puppets is best. Preferably next to a lawn if available. hiking to the parade or festival! It is best to save that energy for the performance. necessary to avoid problems and to maximize our performance energy. often change out comedy props every hour or so. From "Free Ear Cleaning" with a 4 foot Q-tip, to "Free Hair Cuts" with a foam rubber weed wacker! So easy access is a plus, and of course makes those important rest breaks more effective. It also make it a lot easier to perform to a larger geographical area if we start from a more central location. Most concrete or blacktop surfaces, carpet, dry tile or marble floors are acceptable, as is sod. Other surfaces may be acceptable depending on the desired activity. Please ask. Heat is our enemy, cold is our friend. 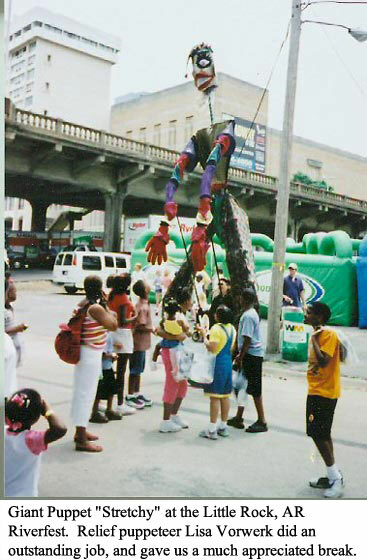 Performing with Giant Puppets, or as a stilt performer is hot, hard work! Keeping warm in winter is very easy to do. Keeping cool in summer is harder! We take breaks as needed to preserve our health and safety. Our truck is insulated and air conditioned so we can cool off, change costumes, eat and get rehydrated in private. We want to be our best for your event! 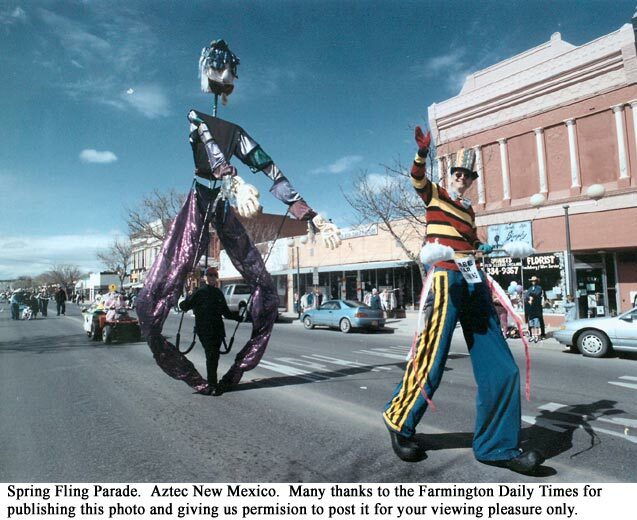 stilt costume to give recognition to your sponsors. 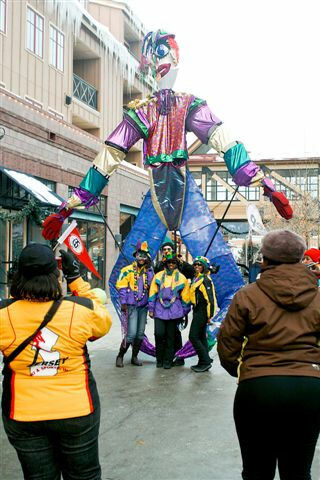 Stilt costume leg banner is 10 x 60 inches overall. 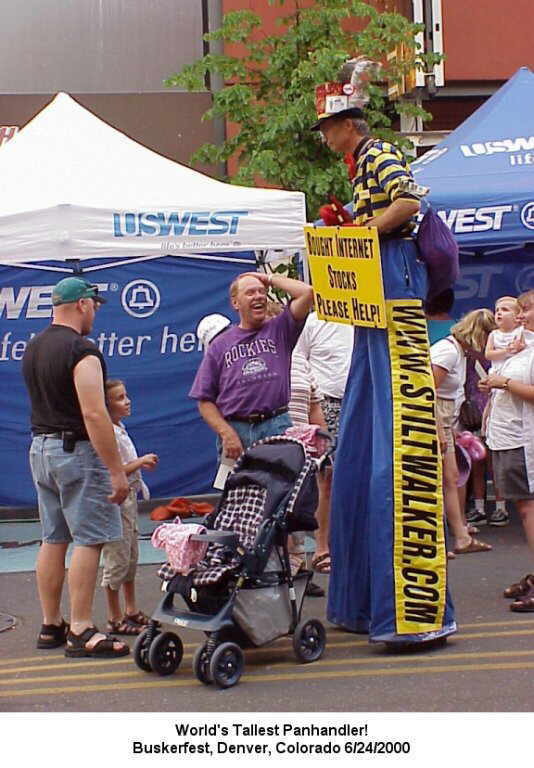 Signs can also be pinned to the back of the stilt performer, or a custom vest can be made with your logo or message silk screened on the back. 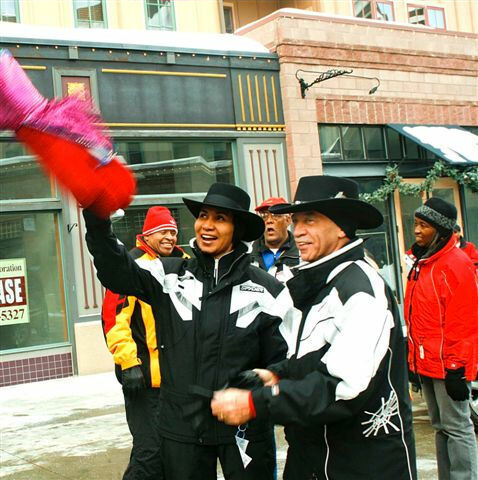 A custom hat, umbrella, jersey, or prop is another way to draw attention to your promotion or theme. Please call to discuss your needs. Signs for the Giant Puppets can be placed on the back of the operator, as well as front and back of the puppet. Holiday or other theme costume requests are welcomed! Please call to discuss your needs. Bubble Tower legs are about 18 inches wide and 14 feet long. Can be seen from a block or more away! Please call to discuss your needs. orange “polka dots” in keeping with your festive atmosphere. And of course the sides of the truck are a great place to hang your sponsor’s banner up to 14 feet long and 10 feet high. Need a Theme Costume or Giant Puppet? Just ask! Many to choose from, or we can either accessorize an existing costume or prop, or create and entirely new stilt costume, prop, or giant puppet to suit your needs. We can even customize the solar powered Bubble Tower Sculpture to fit your theme! "I have a few questions for you. About the stilt party with the hand held wood stilts and bucket stilts: the stilts will be available for 'self serve' enjoyment. Do you need people to help facilitate that or do you take care of that?" keep the stilts away from parked cars, windows, that sort of thing. An open field or tennis court can both work well without supervision. But not in a high traffic cross walk with out supervision. A location close enough so folks will see what is going on and be attracted and come join the fun. But you don't want the kids stilt walking through the craft booths or by the cars, or on a rocky hill side, or walking up behind unwary people, and then falling off their stilts! If the area has some boundaries, that is good, particularly at very large festivals. The stilts have a habit of "walking themselves" great distances otherwise! But the middle of an empty field works well also. At Lowrey Days, they used Americore volunteers who worked out quite well. Americore requires so many hours of volunteer service from their participants. You might ask them for help. When performing, I try and stop over every 40 minutes or so for a few minutes of instruction. If you are unsure, or know that you have a congested venue, then I suggest that you provide some folks. I/we can bring them up to speed in 5 minutes. If you provide a few hay bales or similar, the kids will stand on them when mounting the stilts until they get the hang of mounting the stilts from the ground. Not necessary, but nice. Do you have any fund raising ideas? 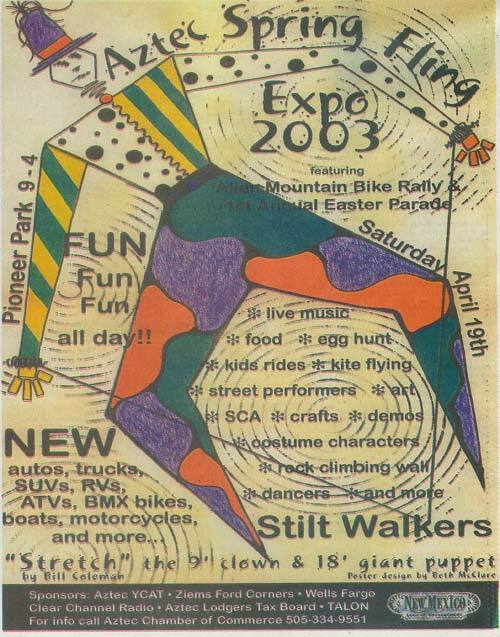 Ask about the Stilt Tournament we held at the Boulder City Nevada Spring Jamboree! http://www.springjamboree.com/ A fun event and a great fundraiser! Alternatively, you could charge for a stilt walking workshop. Another fund raising idea is to sell disposable cameras. It has been my experience that people will want to take photos of their kids on the stilts, with Uncle Sam, and with the Giant Puppet. And a large number of folks will have forgotten their camera. I have yet to see a camera vender at a festival and I can't figure out why. Seems like a sure $ maker to me. don't sell. Sell them at a mark up along with your t -shirts and other festival souvenirs. Let me know if I am nuts. You can also raise funds by hiring us out to a neighboring festival, fair, or event the day before or following your festival. celebrations, trade shows, or even church events. 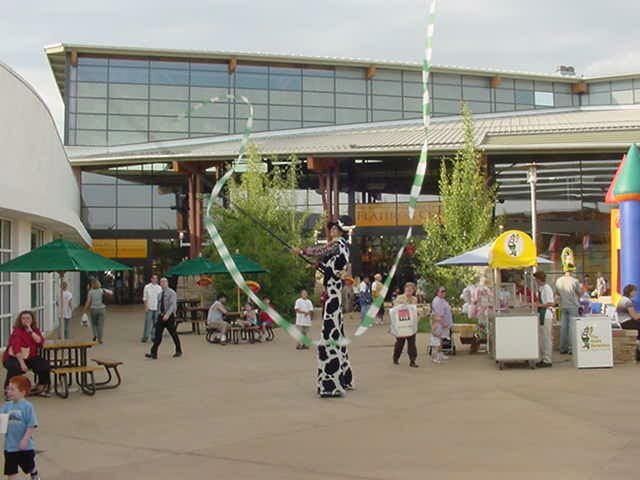 stilt walking workshops for family night or day camp. greeter for any kind of event, even black tie. We have two Bubble Towers and Four Giant Puppets and over 100 sets of the hand held wood stilts, so we can accommodate multiple events on the same day. This means you can hire us out to more than one event on the same day and split the costs and save money! forward to helping you make your event the best ever! Be a Hero! Let Stretch - the nine foot clown entertainer set the mood for your next event. Strolling and atmosphere entertainment at it's best! 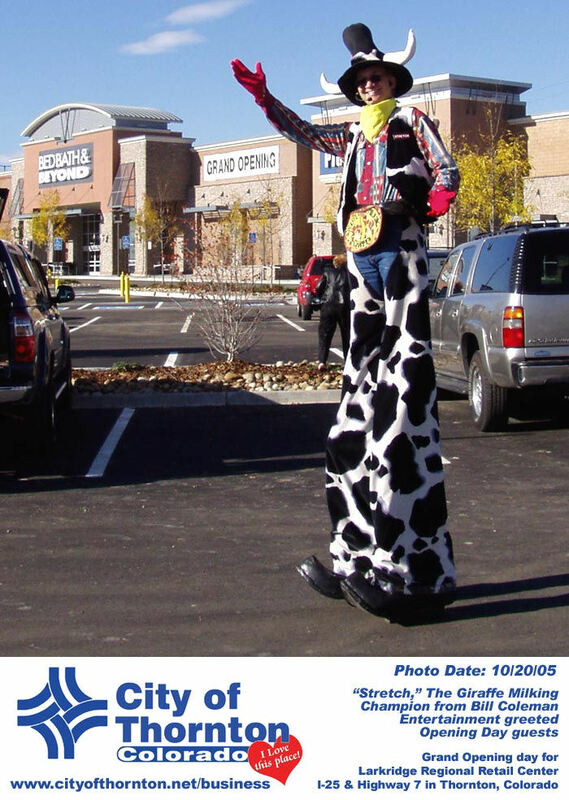 One stilt performer, or multiple themed costumed tall characters for the latest in HIGH profile interactive entertainment for your clients. About a dozen wonderful character costumes to amuse, delight and impress your clients. Custom theme or logo costuming available and encouraged. helps you set the mood for the entire event. makes an excellent greeter for kids and adults alike. Hand shaking, low and HIGH Fives and giant hugs abound! Circus/Cirque/Clown ? That crazy clown: FREE! Ear Cleaning with his 4 foot long Q Tip! FREE! WeedWacker HAIRCUTS! 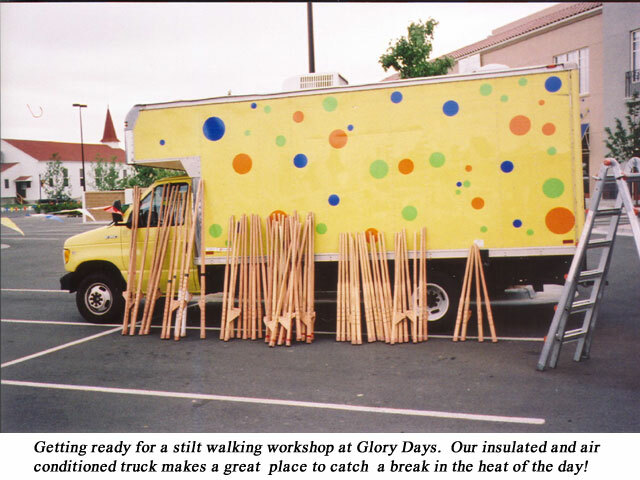 Sky Painting: You supply the music and I'll paint the sky with my 20' pole and 50' ribbon! Let's boogie! Western theme? Please help Cowboy Stretch search for his horse, "Dusty"!!! "That darn horse, the second he found out it was time for our bubble bath, he took off running!" Picnic? Buffet? Sounds like fooood! You've haven't lived until you have seen Stretch do his plate stalking routine with his loooong telescoping fork from on high!!! seeking Cinderella with the WAY oversized, VERY fashion forward shoe! Casino Night? Stretch's experience at the Mardi Gras Casino at Black Hawk, Colorado comes in handy here. His feather duster guarantees good luck to all your guests! Help Stretch find the "winning slot machine" that fits his sure to be a winner oversize quarter! Patriotic or international theme: Uncle Sam is a natural. Tax refunds for everyone! A little short, please help or Bought Internet stocks, please help or YOUR sign and Panhandler Stretch will banter with, engage, and stimulate your guests. Formal Tux or a giant comedy Chef or Candy Cane? Or Toothy - the Illuminated Space Alien? Umpire Stretch? Perhaps a Four Footed creature? Please call today to discuss your needs. Stilts by the Dozen! Hand held stilt walking "workshop"! This is a hands on (and feet!) playtime activity for kids and adults! Test your skill and balance! Keep a way or Catch the red: Catch the red streamer on the end of the sky painting ribbon. Keeps kids occupied for hours! Enjoy Tall Tales of adventure and travel around the world: Raised by the Rocky Flats Circus, befriended by elephants, performances at White Sands and Chernobyl, dancing at Mount St. Helen's, vacations on Three Mile Island, shopping for pants at Needless Markup! Grand Champion Giraffe Milker Stretch's sly wit will have your guest's shaking and giggling! Whirling, twirling, spinning lights! Light up the night with beaming poi. Direct from the fiery South Pacific (but without real fire). An entrancing, glowing spectacle to be remembered. Suitable for stage or strolling: No smelly smoke to cling to expensive drapes or clothing, or irritate sensitive lungs. Arms, and other traffic stopping props. Perfect for grand openings and Trade Shows as well. Spontaneous improv: No telling what activity Stretch will join your guests in: Dancing to volleyball, Denver's most experienced stilted entertainer will try (and succeed at) nearly anything! 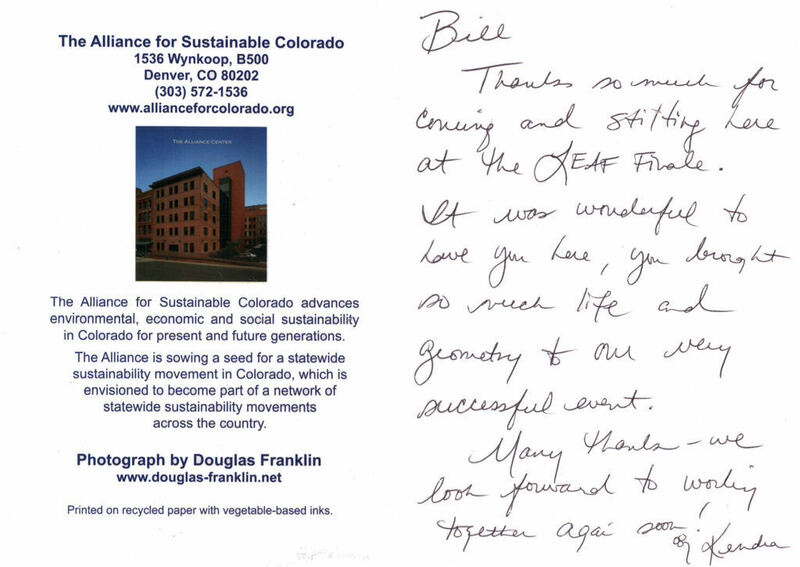 Be a hero to your clients, call 303-922-4655 right NOW! 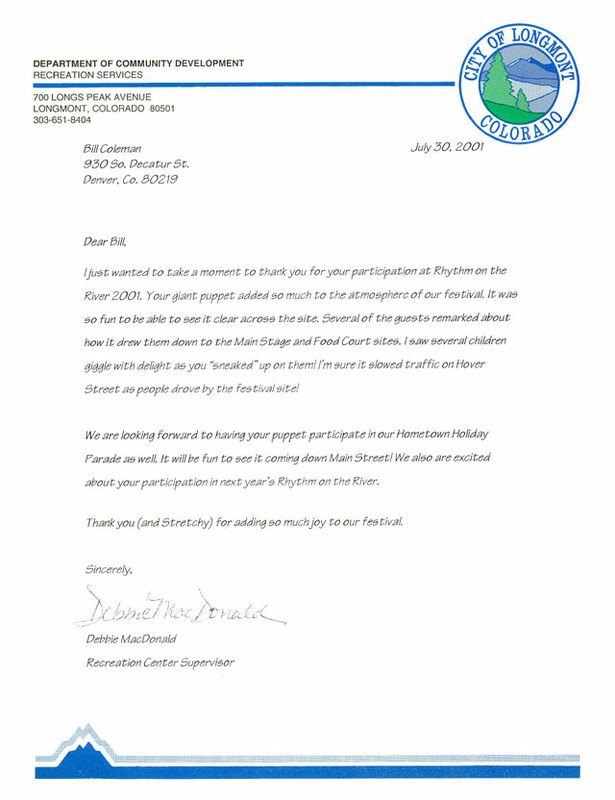 Recent fun festivals and events in Colorado include Trinidad, Fruita, Alamosa, the Adams, Douglas and Routt County Fairs,Central City, Mountain Village, Hayden, Highlands Ranch, Lone Tree, Littleton, Westminster, Keystone, Louisville, Brighton, Superior, Denver, Fort Collins, Boulder, Northglenn, Thornton, Westminster, Wheat Ridge, Colorado Springs, and Vail! Out of state events include Grafton, ND, OKC, OK, Phoenix, AZ, Tulsa, OK, Omaha and Bassett NE, and Boulder City, NV. So eyes UP for Stretch and his TALL Friendly Giant Parade Puppets, sky painting performance art, stilt walking parties and workshops and the solar powered Bubble Tower Sculpture! 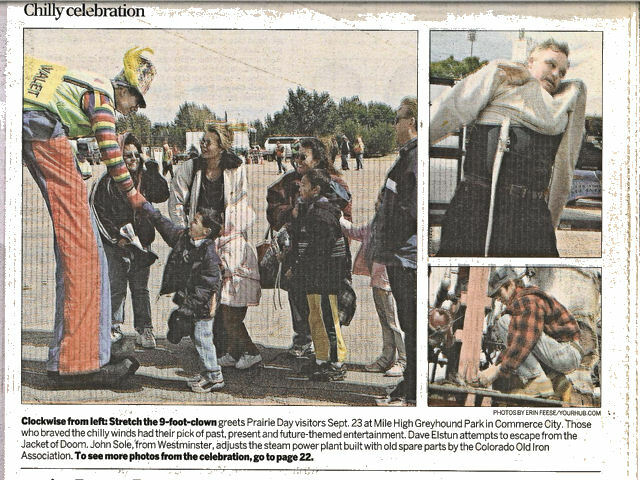 Here are a few of the events “Stretch” The nine foot clown has entertained at. Many photos of these events are available at the web page: www.StiltWalker.com. This list does not include the many parades, civic festivals, and charity walks that I have entertained at. both the adults and children enjoyed them. Definitely an added treat!" 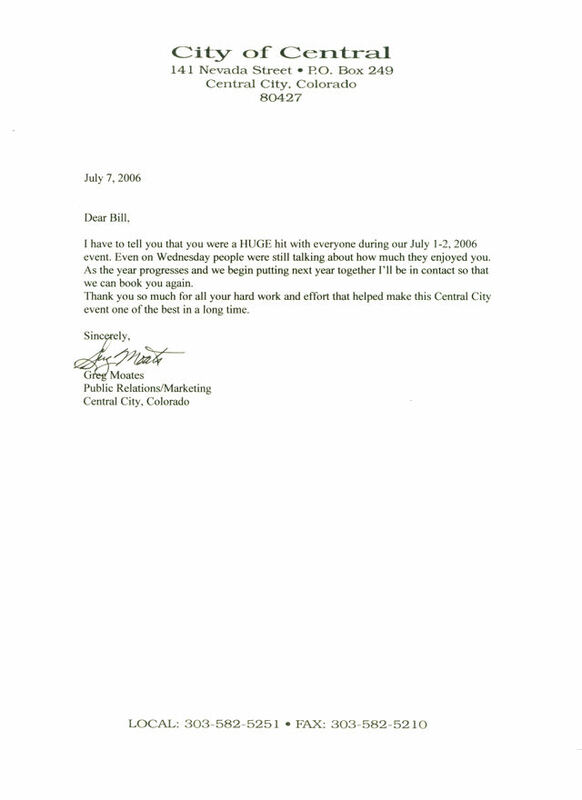 From the January/February 2004 City Style newsletter of the Downtown Tulsa Unlimited on the 2003 AEP-PSO Christmas Parade of Lights. And we had fun as well! In fact, I had so much fun as the Giant Candy Cane, that I did the parade route twice! 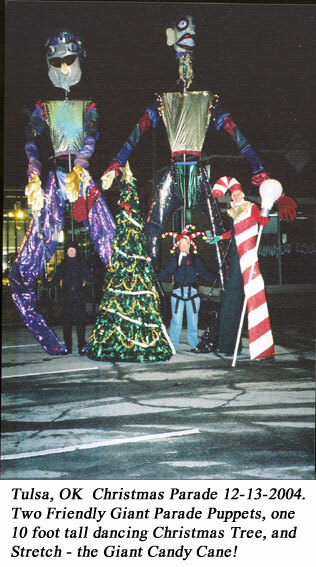 We had the puppets strung with lights, and since getting back to Denver, I have purchased over $300 in additional lighting for the 18 foot tall Friendly Giant Parade Puppets and 10 foot tall dancing Christmas Tree!